Anti-capitalist protesters like to rage at the practices of Starbucks. The US coffee chain that seemingly pops up everywhere, drowning out independent shops and forcing it's wares onto a public who have no choice but to visit its venues. Surprisingly, this isn't a new practice. In the late 19th and early 20th century, the Indian Tea Association practically forced it's wares onto an Indian public unused to the drink. They used all the best capitalist practices, giving away free samples, chasing out those who would try to compete and above all, swamping an area with tea. A market needed to be created for a crop that could grow well in India. England had adopted Chinese tea and now was selling it to the Empire. Now, the Indian tea market is huge and millions around Britain believe that tea originated there. 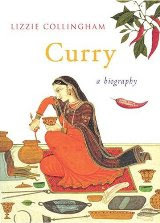 I tell this particular story from this book on the history of Curry, because it illustrates an important fact about that food. Curry, is not a single dish. It's a food that has been adapted, changed and adopted. A food that has been changed sometimes so many times in other countries that it would be unrecognisable to an Indian. But it is also a food that means different things to different people in diverse parts of India. The author shows how over the centuries, various invaders have come to India, bringing their own traditions and tastes. Not least the Portuguese, who brought chiles from South America, radically altering the taste of India's food. The English of course, most famously took curry back home, though the experiments with Indian food that involved curry powder and sultanas probably are best forgotten. Curry is a food recognisable by name from America to Japan (where it is particularly popular as a fast easy to prepare food), but it's taste is radically different. I'm not enough of a curry connoisseur to fully appreciate some of Collingham's finer points about spices and tastes (nor good enough to attempt her recipes). I most enjoyed the sections of social history that she brings into the tale - the Bengali sailors who took over East London Fish and Chip shops in the 1950s, leading to the curry houses that every Eastender considers there own for instance. This is a book that is really about globalisation, but it also shows us how a global market economy, doesn't automatically lead to identical blandness everywhere, but how each community interacts with others, often (except in the case of Sultanas) making something new and better! Few individuals can have had as full a life as Leon Trotsky. A radical from a young age, a Marxist organiser who was sent to prison in his 20s and exiled from his home in Russia, he never stop organising, writing, publishing or speaking in support of the cause of socialism. Where this all he had achieved, he would certainly be an interesting historical character. But Trotsky returned to Russia for the 1905 revolution, swiftly rising to head the chief organisation of that revolution – the Petrograd Soviet. With the defeat of this revolution and the start of the First World War, Trotsky once again had to live in exile. Again, with the start of the February revolution of 1917, Trotsky once again returned to Russia and became centrally involved in the soviet Arguing that the revolution had to continue beyond the gains it had already made, Trotsky worked closely with Lenin in the run up to the October “workers” revolution. This revolution, as Choonara explains, usured in one of the most “equal and democratic” societies, history has ever seen. In isolation though, the revolution was doomed. Both Lenin and Trotsky had always argued that socialism couldn’t be built in isolation, that the revolution needed to be international, and certainly that backward Russia wouldn’t survive for long. Indeed, in the years that followed the October uprising, Trotsky had to form, then lead a Red Army, to defeat the dozen or so invading armies that the Capitalist powers sent to destroy the revolution. While defeating these invaders was one of Trotsky’s greatest triumphs, it left Russia isolated and exhausted - perfect breeding ground for the rise of Stalin’s bureaucracy. The author illustrates how Trotsky’s last great battle was to expose and organise against Stalin – but how the material conditions simply didn’t exist for Trotsky to win this battle. But Choonara points out how that pure fact that Trotsky did fight this fight, ultimately leading to his murder, has left a legacy of revolutionary socialism, which “could have been broken forever by the rise of Stalin”. Choonara concludes this short little pamphlet by pointing out how today the world has many differences with Trotsky’s time, but also many similarities. The ideas of Trotsky, she argues – particularly his unwavering commitment to the central tenet of Marxism, that the world must be changed by the mass of ordinary men and women, have much to offer those struggling for change in the 21st Century. Iron Sunrise starts with a remarkable act of terrorism - a sun is artificially made to go supernova and billions of people die. However the rest of the story is not just about identifying the culprits, it deals with a more interesting aspect of this act of terrorism - the consequences of the revenge enacted. One of the planets destroyed in the explosion, New Moscow, had within the outer reaches of it's solar system a Weapon of Mass Destruction designed to prevent attack on it's owners because of the sheer awfulness of the response. Back in the 1960s, the doctrine of Mutually Assured Destruction (MAD) between the Cold War protagonists went something like this - the use of a nuclear weapon or weapons would inevitably provoke a nuclear response. The response, coupled with the original attack would cause such horrific destruction, that the original attack was rendered pointless. There could be no winners. Charles Stross has updated this. The destruction of New Moscow unleashes Faster Than Light weapons bombs that cannot be detected, and will utterly destroy their target worlds. The catch is, that they will take three decades to reach their destination and no one knows what their destination is. Stross has very cleverly used the great gulfs of interstellar space to his dramatic advantage here. Normally these distances are annoying for SF writers - space based action would take too long for exciting stories. Here it gives the characters in the novel plenty of time to speculate on the consequences of the attack and hunt down the people with the abort codes. This is very much SF for the early 21st century. Email and blogging is updated, lack of bandwidth is an interstellar problem and there are dictatorial regimes around the galaxy, while an impotent United Nations looks on. Iron Sunrise was written in 2004, so a plot line that deals with an imperialistic knee-jerk response to a terrible terrorist attack has obvious real world parallels. It's too the author's great credit that this doesn't dominate the novel in a patronising way, while simultaneously making some great politic points. I fear that this wonderful comic novel is on it's way to becoming a forgotten classic. I desperately hope it doesn't perhaps this review may go some way towards rescuing it for a new generation. The central character, like the author is a Scotsman wounded out of the trenches of the first world war who sets himself the task of writing a book to explain Englishness. Over the course of a year he spends his time at country house parties, political rallies, in pubs with journalists and authors and (most hilariously) playing cricket. Of course, there isn't a glimmer of truth in any of MacDonnell's exaggerated characteristics. What makes the book so funny, is that it's a comic vision of the sort of society that those who think they are English would like to live in. So all the old soldiers are buffoons, the sportsmen all play for the team and elections are all fought with genuine friendliness on both sides. Also there doesn't seem to be any poverty, discontent or racism. Here we have the Tory Candidate that Donald, our hero ends up supporting at the election. Having just sat down from making a speech, questions from the floor are called for. 'I am very glad indeed that the question has been asked,' he said 'and I should like to take this opportunity of thanking the gentleman who asked it, and of congratulating him. Our policy roughly speaking is to see that jobs and adequately paid jobs are provided at once for everyone.' He sat down again amid applause. The man who had asked the question rose again. 'Thank you very much' he said and sat down. Beautifully observed satire, not least because it could, unfortunately be true. John Hoffecker's book is an extrememly scholarly look at one of the oldest questions of archaeology - just how and when did humankind spread around the world. His particular concern here is how people came to live in the most inhospitable parts of the globe, when they did so, and how they succeded living in some of the coldest regions with the most primative of technologies. Hoffecker starts way back. One of the skelton's he describes from Lake Turkana in Kenya dates from 1.53 million years ago. So far back it almost defies comprehension. The spread of humans from their place of origin in Africa, is not simply one of gradual exapansion. The book documents the waves of occupation that took place - climate changes often providing a trigger for human movements. Human's have shown a remarkable ability to adapt to circumstances. And the circumstances sound unbelievable to us. Modern humans before 20,000 years ago, probably couldn't tolerate January mean temperatures of minus 30 Celcius, yet Hoffecker describes the changes to human anatomy that allowed some people to do just that. This isn't an easy book to read - it's scholarly, but it's also academic and probably isn't aimed at the layperson, but it's worth reading if you have a bit of grounding in human evolution and climate change. At 140 pages it's probably one of the most succinct summaries of the issues. In these few words, the total collapse of human society are summed up. Coca Cola's global brand, that symbol of capitalism, the logo known from Alaska to Australia, Russia to South Africa, is forgotten and has become the stuff of dreams. 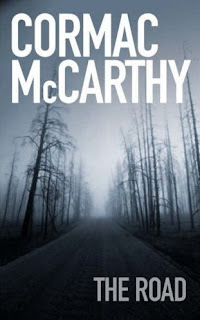 Cormac McCarthy has created a terrible world. Or at least he has understood how terrible the world could be. Wisely he avoids ruining the book by speculating on what caused the terrible collapse of society. Instead we consider the minutae of the lives of those struggling to survive on a planet where nothing grows, most food has long ago been looted, and in small pockets, slavery, cannibalism and murder are daily realities. The titular road, is the journey that our father and son make, on an odyssey to the coast – we never learn the reason. We do however learn, that in such a society there are no morals. Good and bad aren’t necessarily what they were, they become what you do to survive. The gradual awaking of the son to this reality is heart-rending. Ultimately, it’s a stark road they travel. The ending is painfully emotional, which is surprising given some of the places we visit during the journey. There are few novels that cover genuinely new ground, this is one of them. Watching the Australian cricket team destroy the pathetic English equivalent over the last few months has been a joy for those of us who support “anyone but England”. But for those of us who love a good game of cricket, such capitulation in the face of superior skills is a shame because a more balanced match, might produce a more special game. There are great differences between the experience of cricket supporters in England and India, but there are many similarities too. Indian cricket is so much more popular. Clearly it is a sport followed by millions of ordinary Indians; contrary to the way that cricket historically has been the province of the middle and upper English classes. Bhattacharya detects however, how the cricket grounds are no longer just the realm of ordinary people though as corporate boxes increasingly dot the arenas. He also tells how Indian cricketers are often superstars, their faces selling soft drinks and health aids, something Flintoff et al. have only got involved in very recently. For the cricket fan this book is a lovely work – any true fan of the sport (as opposed to a particular national team) will recognise the authors tales of following the game at work, or dreaming of the impossible in the middle of the night as a game is recounted over the radio from the other side of the world. 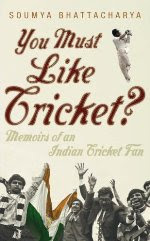 There is more though than amusing anecdote - the author describes being in the middle of a match that descended into rioting as rivalries between the Indian and Pakistan nations were played out on the field. Sport of course, can’t be separated from the society within which it’s played. Simultaneously, it offers some escape from those societies too. But something else is true, there is a universal experience that all sports fans have. This wonderful little book shows the hope, despair, and passion at the heart of all sports fans, wherever they are in the world. Knowing this, reminds us that we are all, after all, human. About three quarters of the way through this comic book introduction to the perils and issues around Climate Change, Kate Evans’ main character stamps his foot and laments “You know for a comic book this is not very cheerful”. Given that in the same panel, we’re told that Britain’s emissions of Carbon Dioxide have increased by 9% since 1990, you can perhaps understand the sentiment. Kate Evans’ has created a brilliant introduction to the subject. By utilising the comic format, she will I hope, reach an audience that might be put off by other works on Climate Change, but the format in no way patronises the reader, nor dodges the science. Kate takes us through some quite complex issues. She doesn’t just look at what causes the Greenhouse effect, she takes on those diminishing numbers of individuals who argue that the effect is not related to human activity, and she successfully skewers those politicians and corporate fat-cats who would put the future of the planet at risk, rather than address such thorny questions as reducing emissions. By humanising these characters – corporate interests are represented by a cigar wielding, suit wearing business men – Kate prepares us to discuss and debate the issues with those around us. The “hero” of the book, a young man who debates and questions the corporate fat cat, concludes at the end, that his opponent is a “maniac”, whose policies will lead us “all to fry”. Rather cleverly this brings in a factor that I think is missing from many articles on climate change. The issue is so great, the challenge so large, that once you hear the facts and figures, it can lead you to despondency. Kate’s comic book hero, falls into a fit of depression, only to rally and become a campaigner for change. I don’t necessarily agree with all of Kate’s suggestions. Or perhaps it’s better to say that I would emphasise some things differently – I doubt that horses will become a major feature of urban transport this side of a total collapse of modern civilisation for instance. But these slight disagreements shouldn’t lead anyone to dismiss the book. I don’t believe that the environmental movement and the scientific community have yet found a perfect answer to how an environmentally friendly society would look – that’s something we can argue along the way. The great task at the moment is to clarify the issues for ordinary people, and offer some practical suggestions about how we can start campaigning and changing things now. 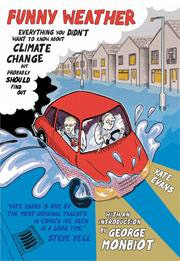 At the end of the comic, her characters (including a George Monbiot look-alike) join a demonstration, making the point that the major changes that are needed to save the planet will need to be fought for – and Kate Evans should be applauded for writing an extremely useful weapon in the battle to save the planet. 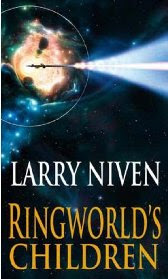 The final part of the Larry Niven’s Ringworld SF series is a brilliant return to form. Millions of readers like me thrilled at Niven’s original novel, depicting as it does a mysterious ring around a far sun, populated by billions of humanoids and advanced, strange technology. It was the ideal place to set a story of exploration. The first volume was superb, rightly winning awards and public recognition. The second book Ringworld Engineers was very good. Personally I found the third unreadable - a confusing plot that missed out the exciting stuff about exploring the strange new world. This final book ties up all the loose ends of the series - and from a few of Niven's other stories. It centres on the final “battle” for the Ringworld which is now a prize for all the galactic civilisations of Niven’s “Known Space”. The Ringworld takes damage as those civilisations fight to get control, but there are other forces on the Ringworld who want to protect it. Their ingenious idea to save this unique structure is mind-boggling. But this after all is speculative fiction, and it is a fitting climax to one of SF’s great series. 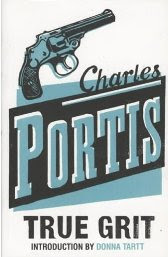 It's a delight then, to find that Charles Portis' original novel has all the excitment of the film, as well as most of the memorable lines (if not the Hollywood ending). The Wikipedia entry on the novel, has lots about the themes of "transition" and change. It is that, but it's also a fairly straight-forward tale of revenge. We meet Mattie Ross, an aged spinster who looks back on what must have been the most exciting moment of her frontier life - the time she road into the wilderness to avenge the killer of her father. Along the way, we meet a variety of characters, some good, some bad, but all of them flawed who give us a unique insight into some of the whys and wherefores of western life. Particularly annoying and illuminating is Mattie's christianity, which gives her courage and helps her drive onward. Unfortunately it also gives her an incredibly blinkered view of the world, though her self-righteousness is wonderfully humourous at times. Also interesting at times is the insight into how the civilising force of commerce is seen as taming both the west and the wild men who live in it. Rooster Cogburn is seen in this context as the last of a breed - frontier men whose justice was as hard as the land around them, and whose morals needed to be modernised. Donna Tart's new introduction to this reprint, rightly awards the accolade of "Cult Novel" to the book. If you liked the film, it's well worth a read, but even if you hate westerns you might get something out of it.